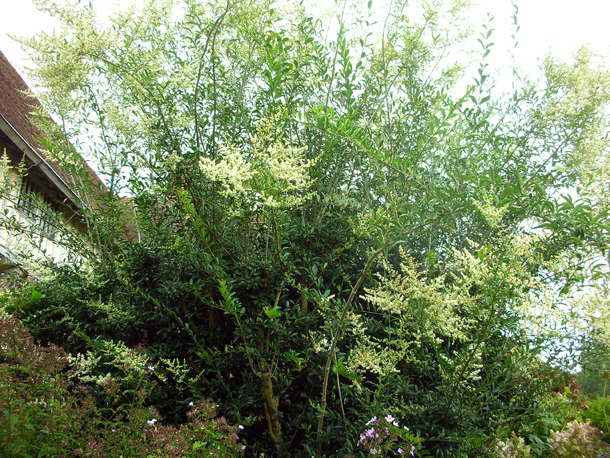 Ligustrum quihoui - I couldn't believe it when I realised this was a privet, not so long ago I was talking to my partner Graeme and me & him were like eugh never to grow something as common and as 'boring' as a privet, too many gardens were already cursed with this bog standard shrub and I was sick of seeing it on scrubby roadsides. But seeing the small flowers raining down on everything as millions of bees gently tapped on them I couldn't help but gasp. I have never seen a free form privet and can't wait to get into the 'special pruning' that is done here.